preference for only one or two suitable latrine areas - suitable to the wombat, that is. They may be less desirable to the owner of the wardrobe or the bed selected by the wombat as its substitute for a bracken clump. Figure 8.2 A sliding cupboard door is no barrier to a determined wombat. under that of a neighbour. Even wombats reared on farms or in homes adjacent to bushland seem to prefer the foundations of a building as their first burrow site, and occasionally wild wombats also indulge in this regrettable activity. When a wombat, even a very young one, meets an obstruction, it either pushes through it or digs underneath it. In the house, a closed door comes into the category of an obstruction. Where a door will not yield to headbutting tactics, the adjacent floor will be subjected to intensive 'digging'; while a wooden floor may not suffer very much from this onslaught, a carpet is never the same again. 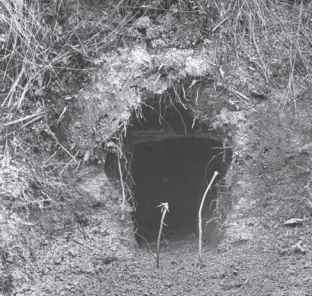 Still baulked, the wombat will usually attack the door itself; the scraping, scooping and biting actions used in excavating a burrow are all employed, often with remarkable success (Figure 8.2). This kind of determined attack on a door usually takes place because of another of the young wombat's instincts: its fundamental need to follow and be near its mother at all times. So a young wombat left alone, either in the house or outdoors, will try to reach its human 'parent', and it is quick to learn that doors are the means of ingress or egress, even if they are closed. 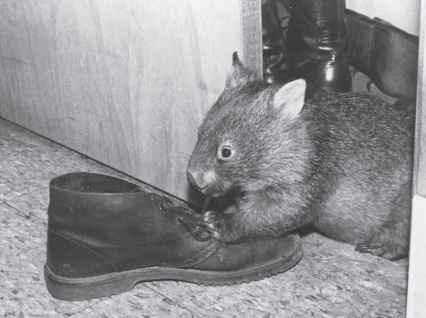 A young wombat also learns the law of cause and effect at an early age, and one instance of this is its use of a bite as a method of communication. When a wombat wants something - food, a romp, or just company - it will bite the nearest human leg. Finding that a nip on the ankle, even a gentle one, gains the human's attention, it is a short step then for the orphan to obtain its particular requirement. Success leads to frequent use of this method of expression; and as the wombat grows, so does the strength of its bite. It also acquires an assortment of signals, in addition to the bite, that are as clear as any verbal language, provided that the human is receptive enough to interpret them. Another aspect of the wombat's normal way of life that can cause some friction and difficulty in the home is its tendency to be active at night, rather than during the day. At first, when the orphan is small and being fed and attended to frequently, this nocturnal habit is not noticeable, but as it grows it begins to spend more of the daylight hours asleep, saving its energy for the evening and night. 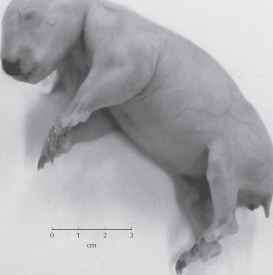 Lack of sleep is a chronic condition among wombat fosterers. 'Things that go bump in the night' are nothing in comparison to a wombat looking for entertainment.